Solid plastic restroom stalls are incredibly resilient and are made to last for many years in high traffic areas and those that are prone to destruction. Solid plastic bathroom partitions come in many different colors so that you can choose what works best for the color scheme the rest of the facility has planned. 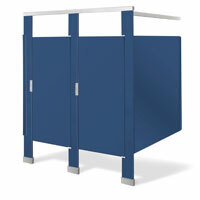 Floor to ceiling mount, wall mount, and ceiling hung bathroom partitions are available in solid plastic toilet stalls. The different mounting styles give you a chance to select which one works best depending on the construction of the facility.